Many companies and budding entrepreneurs will tinker or experiment with various designs in order to create the perfect product to cater to their niche. However, creating a tangible product not only involves a lot of time, work, and capital, but does not simply amount to amalgamating numerous modules and components onto a single board. There are many ticking time bombs that you need to be aware of as the process transpires. Failure to stay abreast of such issues will make it hard for you to solve them before it is too late. 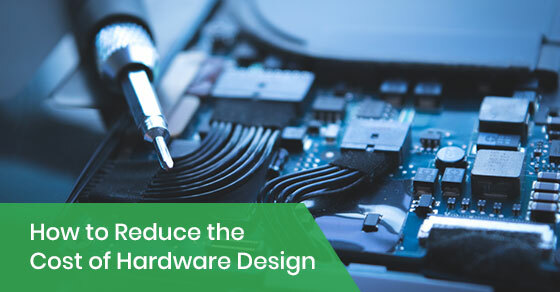 Here, the focus will be on the steps you can take to help reduce the cost of hardware design. By reducing your production costs, you will be able to stay competitive in an increasingly volatile marketplace and use cutting-edge solutions to give you a serious competitive edge. Before you opt to industrialize your project you should factor in lead-time, quality, and cost. These three must always be considered before any project is started, and your objective should be to find the best position within the manufacturing management triangle. In fact, if you are unable to find the best position or your company loses its equilibrium within the manufacturing management triangle, the end result will be increased production costs, poor quality products, and much longer lead-times. Such issues can make or break a company, particularly those that are just beginning their operations, so being prudent and planning well ahead of time can save your company costs as well as headaches down the line. In most cases, the finalized product will comprise of several different elements or components including, but not limited to, certifications, set-up, management, manufacturing, shipments, quality control, engineering, and materials. However, if you want to reduce your hardware design costs then you need to consider all of the above costs at the very beginning of the project, instead of during or after the product has been finalized. This may seem self-evident to some, but many companies fail to factor in the cost of the final product and suffer the consequences during the production phase. They end up going over-budget and are forced to cut corners to save money during production, leading to quality dropping significantly. Given the number of competitors in the market fighting for market share, companies need to cut costs without compromising quality so that their clients will remain satisfied and they remain profitable. Another way to reduce the costs of your hardware design is to utilize the exact same resistor throughout. You should also use the exact same MPN, manufacturer, tolerance, and packages as well, if possible. In fact, if you opt to use even one additional different component your costs will increase, and you will have to find another supplier from thousands of options. You will also need to source an additional component from millions, and use another feeder on a place and pick unit. Moreover, you will also need to secure additional inventory management as well as an additional incoming inspection. Failure to use the same components whenever possible will not only lead to an increase in costs of your materials, but also increased management, setup fee, and manufacturing expenses as well. By placing the components on the same side of the PCB you will be able to reduce your manufacturing expenditures. One of the advantages of single-side boards is that they only need to go through the reflow oven a single time. There are fewer steps and procedures involved with single-side boards, which will also lead to short manufacturing times. The end result is that manufacturing costs are reduced significantly when you install all of the components on the same side of the PCB, whenever possible. If your board uses both surface-mounted device and dual inline pin components then you will require both an SMD line and a DIP line in order for the product order to be fulfilled, meaning your company will need to pay 2 setup fees. However, if you use only SMD components for your boards then you will only need to pay one fee. SMD manufacturing fees also tend to be much lower than DIP manufacturing fees. The general rule of thumb is to avoid having components placed too close to each other. There are evidently certain exceptions, such as when fabricating an HDI PCB that has elevated spacing constraints. However, generally speaking, it is best to space apart components in order to adhere to pick and place tolerances as well as silk-screen tolerances. If you decide to lower the tolerance for placements then you will need to use machinery that is more accurate, to ensure that operations can continue properly. However, using more accurate machinery will also mean that you will need to spend more money to obtain said machinery. Try and avoid tightly constrained components whenever possible to lower your manufacturing costs. To learn more about reducing the cost of your manufacturing design, call Circuits Central at 888-821-7746 or contact us here.